CampNavigator.com® an exclusive portal providing summer camps & summer programs information, operated by WISHESH DIGITAL MEDIA Pvt. Ltd. ("WISHESH DIGTIAL MEDIA ") welcomes you. 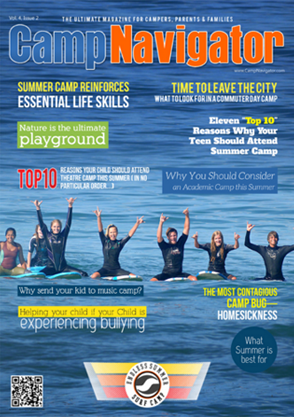 WISHESH DIGITAL MEDIA's CampNavigator.com® & CAMPNAVIGATOR e-Magazine serves the Summer Camp Directors, Campers, Camp Vendors and Camp Job seeker community. WISHESH DIGITAL MEDIA Pvt. Ltd provides users with access to a rich collection of resources, including without limitation various communications tools, forums, shopping services, search services, personalized content and branded programming through its network of properties which may be accessed through any various medium or device. You also understand and agree that the WISHESH DIGITAL MEDIA Services may include advertisements and that these advertisements are necessary for WISHESH DIGITAL MEDIA to provide the Services. You also understand and agree that these may include certain communications from WISHESH DIGTIAL MEDIA, such as service announcements, administrative messages and the WISHESH DIGITAL MEDIA Newsletter, and that these communications are considered part of WISHESH DIGITAL MEDIA membership and you will not be able to opt out of receiving them. Unless explicitly stated otherwise, any new features that augments or enhances the current Services, including the release of new WISHESH properties, shall be subject to the TOS. You understand and agree that the WISHESH DIGITAL MEDIA Services is provided "AS-IS" and that WISHESH DIGITAL MEDIA assumes no responsibility for the timeliness, deletion, mis-delivery or failure to store any user communications or personalization settings. WISHESH DIGITAL MEDIA Pvt. Ltd. Copyright ©2012 CampNavigator.com ®. All rights reserved. This disclaimer/terms of service notification is subject to change without notice. You acknowledge that WISHESH DIGITAL MEDIA may or may not pre-screen Content, but that WISHESH DIGITAL MEDIA and its designees shall have the right (but not the obligation) in their sole discretion to pre-screen, refuse, or remove any Content that is available via our portals and Services. Without limiting the foregoing, WISHESH DIGITAL MEDIA and its designees shall have the right to remove any Content that violates the TOS or is otherwise objectionable. You agree that you must evaluate, and bear all risks associated with, the use of any Content, including any reliance on the accuracy, completeness, or usefulness of such Content. In this regard, you acknowledge that you may not rely on any Content created by WISHEHS DIGITAL MEDIA or submitted to WISHESH DIGITAL MEDIA, including without limitation information in WISHESH DIGITAL MEDIA Message Boards and in all other parts of the WISHESH DIGITAL MEDIA Portals and Services. You understand that the WISHESH DIGITAL MEDIA Services and software embodied within the WISHESH DIGITAL MEDIA Portals and Services may include security components that permit digital materials to be protected, and that use of these materials is subject to usage rules set WISHESH DIGITAL MEDIA and/or content providers who provide content. You may not attempt to override or circumvent any of the usage rules embedded and any unauthorized reproduction, publication, further distribution or public exhibition of the materials provided on the WISHESH DIGITAL MEDIA Portals and Services, in whole or in part, is strictly prohibited. WISHESH DIGITAL MEDIA forbids you from any attempts to resell or put to commercial use any part of the Site; any collection and use of any product listings, descriptions, or prices; any derivative use of the Site or its contents; any downloading or copying of account information for the benefit of any other merchant; any renting, leasing, or otherwise transferring rights to the Site / Service; displaying the name, logo, trademark or other identifier of another person (except for indiatimes.com or you) in such a manner as to give the viewer the impression that such other person is a publisher or distributor of the Service on the Site, or any data gathering or extraction tools; or any use of meta tags. You may not (whether directly or through the use of any software program) create a database in electronic or structured manual form by regularly or systematically downloading and storing all or any part of the pages from this site. YOU EXPRESSLY UNDERSTAND AND AGREE THAT: YOU'RE USE OF THE WISHESH DIGITAL MEDIA SERVICES AND SOFTWARE IS AT YOUR SOLE RISK. THE WISHESH DIGITAL MEDIA SERVICES AND SOFTWARE ARE PROVIDED ON AN "AS IS" AND "AS AVAILABLE" BASIS. WISHESH DIGITAL MEDIA AND ITS SUBSIDIARIES, AFFILIATES, OFFICERS, EMPLOYEES, AGENTS, PARTNERS AND LICENSORS EXPRESSLY DISCLAIM ALL WARRANTIES OF ANY KIND, WHETHER EXPRESS OR IMPLIED, INCLUDING, BUT NOT LIMITED TO THE IMPLIED WARRANTIES OF TITLE, MERCHANTABILITY, FITNESS FOR A PARTICULAR PURPOSE AND NON-INFRINGEMENT. The WISHEHS DIGITAL MEDIA Services is provided for informational purposes only, and no Content included in the WISHESH DIGITAL MEDIA Portals and Services is intended for trading or investing purposes. WISHEHS DIGITAL MEDIA and its advertisers shall not be responsible or liable for the accuracy, usefulness or availability of any information transmitted or made available via WISEHSH DIGITAL MEDIA Portals, and shall not be responsible or liable for any trading or investment decisions based on such information.